Earlier this week my uncle lost his battle with cancer. There's no way to write that sentence that could possibly convey just how shattered I am by his death. He was a beautiful soul, with an incredibly mischievous spirit - he actually attended my wedding dressed as a woman! Another story for another time. We're heading off tomorrow to the mainland for his funeral. I just hope I can hold it together. I'm teary at the best of times. So I found myself in need of some sympathy cards. I couldn't focus enough to design anything original, so I cased a couple of my recent cards. I thought I'd share them here because I wanted to show how a few subtle changes made the same design work for a sympathy card. Card One. See the original card HERE. And here are my sympathy versions. I tried two different stamps from the same Papertrey Ink set for the die cut. They both worked beautifully. And Card 2. See the original card HERE. Again, only minor differences. Such sad news.....My Sincere sympathy to yourself and your family sweetie. He will always stay in your heart! Danielle, so so sorry for your loss. I hope you find some comfort in your memories of him. 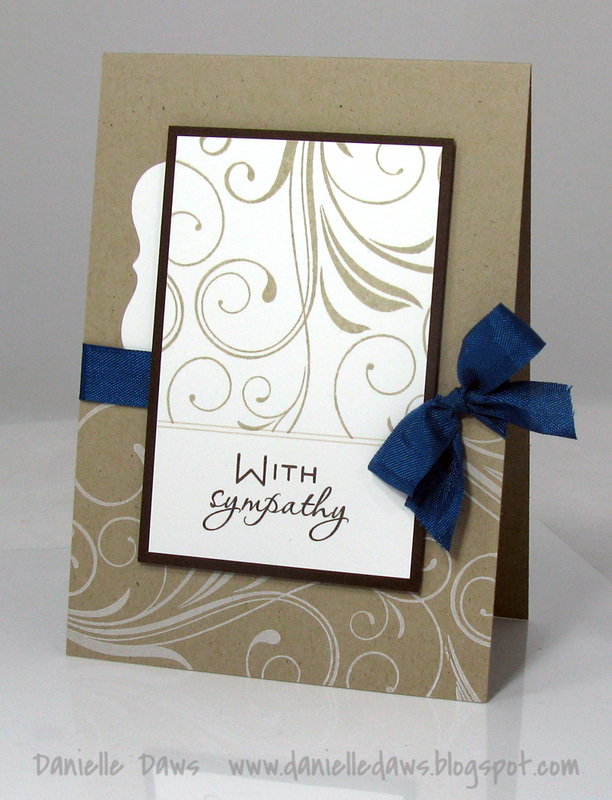 ((hugs)) Lovely sympathy cards. I am so sorry to hear of your loss. I have an Uncle the same, who turned up to my wedding in black singlet, shorts and gumboots. Treasure your wonderful memories of him DD. Sorry to hear your news Danielle. Take care. My deepest sympathies to you and your family. I lost my Dad to cancer. And, last year we lost our 18 year old nephew to it. So tragic. Glad you have so many fond memories of your Uncle. So sorry to hear of your loss Danielle. I hope you make it through the funeral ok. We lost an aunt late last year to cancer, who also was a big part of our lives. I hope your family begins to heal very soon. Im so sorry to hear this devastating news, My thoughts are with you and your family. Be strong and take care. I'm so sorry to hear about your uncle... this card is beautiful though and so tasteful too. So very sorry for your loss, Danielle. Oh Danielle, I'm so sorry. While you treasure those memories of him you will never truly lose him! Your cards are beautiful you really capture the right mood of reflection and caring. So sorry, Danielle... thinking of you as you travel for your uncle's funeral. What you shared of him made me smile; I hope that in time your memories bring you great joy whenever you think of him. Oh DD this is sad news, I'm so sorry for your loss. Hope you got through the day as well as can be expected, and will smile often when you think of your uncle. Your card is lovely, understated and just perfect. These are positively stunning! Everything about these is perfect. This is late to comment, but I hope most of the pain from losing your uncle is gone, and wonderful memories pop up every time you think of him. Mischievous souls are the frosting on the cake of life. By the way, I found these using a Google image search, and I will spend entirely too much time now looking at all your beautiful creations. Thank you for sharing your inspirational art!